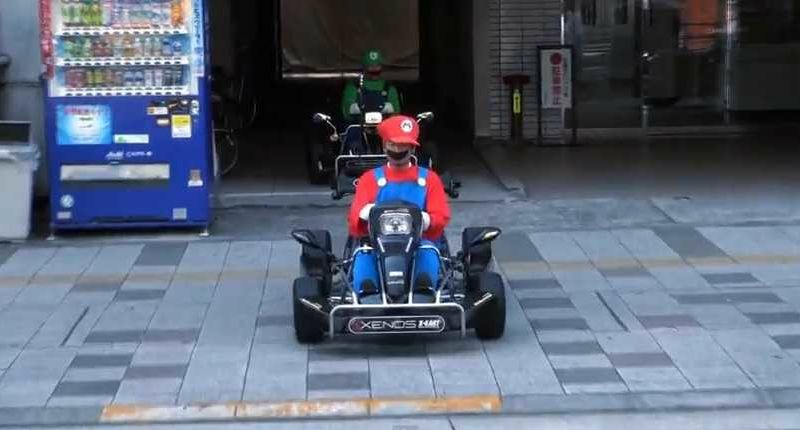 Tokyo commuters recently found themselves involved in a real-life game of Mario Kart when the guys from Japanese car site Cliccar donned Mario and Luigi costumes and took to the streets in a pair of street-legal go-carts. The street-legal X-Karts have top speeds between 35-50 mph, and require a standard driver’s license to fraternize with traffic on public roads. Getting your hands on one of the carts will likely cost around $4,900. There’s no info as to whether the X-Karts come with any mushroom- or flower-fueled power-ups, though judging by how tiny they look in comparison to the trucks and vans in the video below, they could probably benefit from any accessories they’re given. The video also features a great look at how the pair were received by fellow commuters around Tokyo, with both vehicle passengers and pedestrians snapping photos and throwing thumbs-up at the Cliccar crew. Never underestimate the power of Mario and Luigi to draw a crowd anywhere they go.